I can't believe we have been retired for 2 1/2 years now. I have to say that we are enjoying every minute of it. One reason we are so happy with our new life is that our dream of traveling, when we retired, is really coming true. Since retiring, we have made several quick road trips that brought us to Washington, DC, Charleston, SC, Columbia, SC, Gatlinburg, TN and Cherokee, NC. We enjoyed a vacation in Cancun, Mexico, our first all-inclusive ever. We spent a week in Vegas with family and friends and just got back from our second cruise. I thank my kids for gifting a couple of these trips to us and for my sister for inviting us to Gatlinburg to join her and her husband when she was offered a free hotel stay there. We did treat ourselves to the two cruises though. Traveling is wonderful but does cost money and being retired means not having the income we used to have. But we have found that we can enjoy a wonderful vacation on our tighter budget by cruising. We definitely had to tweak our budget since we retired but when we did, we made sure that we were budgeting enough for vacations. For a look at how we've been budgeting you can read our two previous posts: Keeping Track Of Every Penny and How We Save On Groceries To Have More For Vacations. So how do we make cruising work for us. 1. When we cruise for the sake of taking a very nice vacation, we worry less about where the cruise will take us and more about the best deal. The cruise we just came back from took us to Cozumel, Mexico and Grand Cayman, Cayman Islands. We have been to both of these destinations before. We cruised to both places on our very first cruise 15 years ago. But we found a great deal on Carnival. The cruise cost $279.00 per person with $50 onboard credit per room. 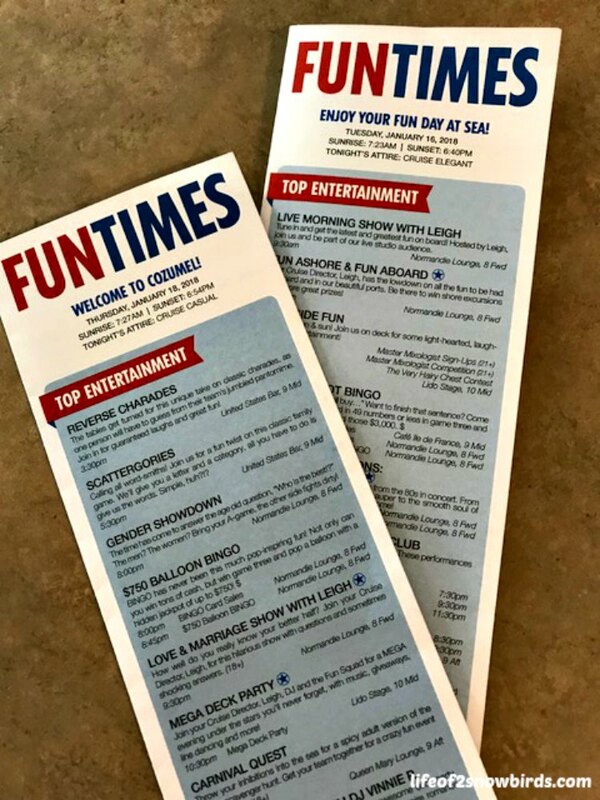 If you have not cruised before keep in mind that there are Cruise Government Taxes and Fees, $186.50 for this cruise, and mandatory gratuities charge which we prepaid when we booked our cruise and that added another $129.50 to the price of the cruise. 2. We are not fussy about the cruise line we choose. We will go with the line that is offering the biggest bang for the buck. We look at the deals of all the cruise lines. We have only vacationed with two cruise lines so far, Royal Caribbean and Carnival and have been very happy with both. 3. We cruise out of the ports we can drive to. We save a ton of money on not having to fly to a port. Now that we are snowbirds and live half the year in Florida, we have 3 ports all within a 2 hour drive and Miami is 4 hours from us. We do need to park our car for the duration of the cruise. It cost us $75 to park for 5 days at the Tampa port. 4. We skip the expensive excursions and get to the beach on our own. We went to the beach in both Cozumel and Grand Cayman. Our friends recommended that we spend the day at Mr. Sancho's Beach Club if we wanted to do the beach in Cozumel. It cost us $40.00 round trip total by taxi to get there and we spent another $10.00 for drinks. 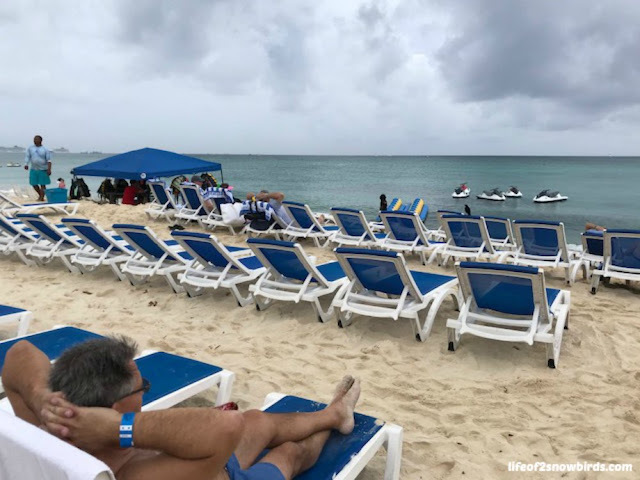 We paid $20.00 total round trip to get to Seven Mile Beach in Grand Cayman and $10.00 to rent two lounge chairs at Public Beach. There was no charge to get onto either beach. Compare that to the $69.99 per person excursion that gets you transportation to the beach and a chair at a beach in Grand Cayman. 5. We drink the water, coffee, tea, hot chocolate, lemonade and iced tea (and juice and milk during breakfast hours) and not purchase the beverage packages. 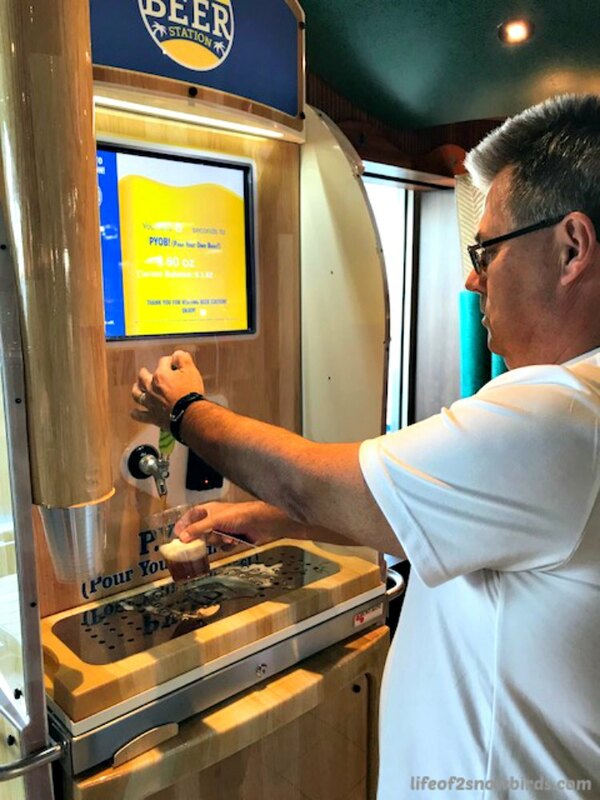 We had a few beers from a machine where you dispensed your own. Soko loved it! It cost slightly less than if we got a beer from the bar. After using the onboard credit we had, we were left with a bill of $38.00 at the end of the trip for drinks (and bingo!). Compare that to $56.95 +15% gratuity per day per person for the beverage package. 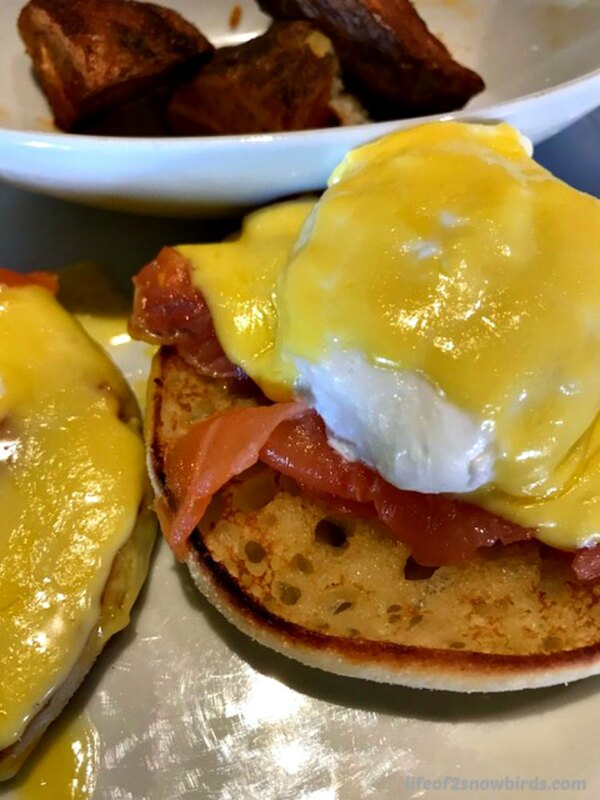 Cruising gives us a chance to try new food like this eggs benedict with salmon instead of ham. Yum! Cruising definitely works for us as far as staying within our vacation budget and we enjoy all they have to offer! Nice! That was a great find! I am definitely putting this info in my vacation notes. Thanks so much for sharing! Nice tips. I'm not much of a cruise person as a result of motion sickness years ago, but I'm thinking of during an Alaskan cruise. Thanks for sharing on Sunday's Best. I know some people who swear by those motion sickness patches and I always use those pressure point cuffs but I'm not absolutely sure if they are preventing me from having motion sickness or maybe I wouldn't get sick if I didn't have them on but I'm not taking a chance by not wearing them! Great info! My husband and I will retiring soon, and we are looking forward to traveling. Your tips are very helpful! I hope that you and your husband will enjoy your retirement as much as we are enjoying ours! We love cruising and our next one is to Japan in October. So much to do (or not if you just want to relax). Thanks for sharing with us at #overthemoon and happy cruising. You are so lucky! I bet you are excited. And yes, that's what I like about cruising. Lots of chances to be busy if you want to be and lots of places to just sit with a book! You're very close to me. I live in Pasco County on the west coast. Great tips you shared. I do love watching winter weather reports while sitting in shorts and t shirt. Isn't so much easier living in Florida during the winter?! That is great advice! I have heard that you can get a great deal if you wait. We've never tried it but though that we might once we retired. Well we are retired soon so I think that is how we will book a cruise for next winter. All good advice and it looks like you had a wonderful trip. Never been on a cruise maybe one day. Hope you get to take a cruise one day! We love to cruise and have taken many. Our favorite cruise line is Holland America. Probably will never do Carnival again. My sisters and I did a five day cruise and it had the rudest people I have ever had the displeasure of spending time with. Cruising is a great way to see the world though at a great price. Wow! That's terrible that you had such a bad experience. I would love to try cruising with other cruise lines to compare. I have Holland America on my bucket list. We are trying our best to be able to enjoy our retirement on a retirement budget! Thank you for sharing!! You might just get me liking the idea of cruising....it's not something that I have done or really want to do, but you make it sound better than I expected. I must admit I get really car sick, plane sick, and I'm afraid boat sick too! I think cruising is one of those things that either you love it or you don't but it's worth a try. I heard the motion sickness patches work and I use the pressure point wristbands and haven't gotten sick. But then again I don't usually get motion sickness. Hope you get a chance to try it. 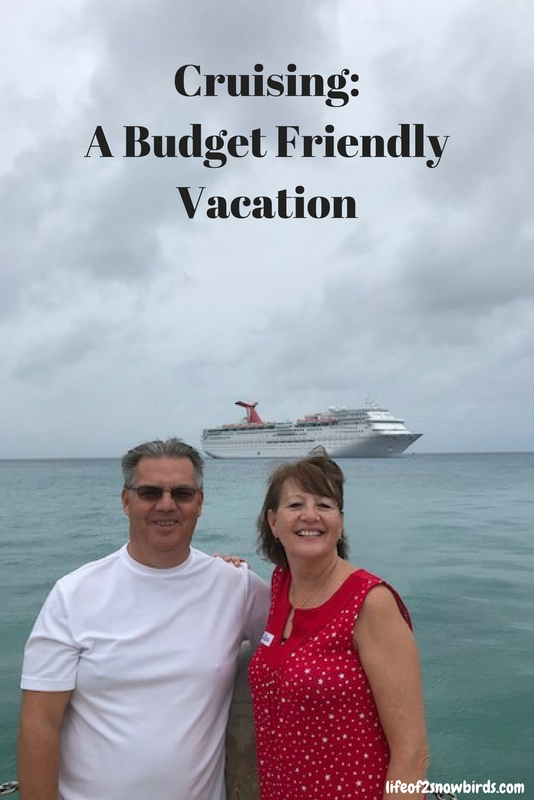 Although we've never taken a cruise, my husband and I are budget travelers too! Thanks for the tips! Do you blog about your budget travelling? I always am looking for good advice! Great suggestions to make a cruise budget friendly!! Yes. I cruise can get very expensive or can be very budget friendly. We like to keep it budget friendly so that we can afford to go on more cruises! This is great info and it is so great to see you having so much fun! I love to cruise. It is the absolute vacation. Once on the ship, you really do not have to worry about anything else. Thank you for sharing. Yes! I love the same things you do about a cruise. It makes a perfect stress free, relaxing vacation! Great tips! We are just a few years from retirement and would love to travel more! You will love the ability of coming and going as you please!